For some of you who were not lucky enough to get your hands on the 1st Astran Tekno model, the Scania 111, you may have you chance again to own an Astran Tekno collectors item. After a brief chat with Astran MD, Kevin Letham, he tell’s me there are just a few 1/50 scale models left on the pre-order list. Currently the models are due to finally arrive from the Tekno factory in February and i’m told they make excellent Valentines gifts!!. 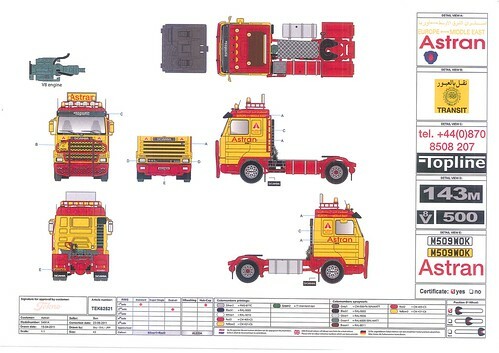 If you want to be in with the chance of getting your hands on one of only 450 models, email kevin@astran-cargo.com and title your email “Scania 143 Tekno Model”. The truck in production is a Scania 143 Streamline, complete with tilt trailer as driven by Trevor Dodwell and as featured in my top 3 Astran Liveried trucks of all time. This particular truck, M509 WCK, ended up being at the top of my top 3, read all about it by clicking HERE. 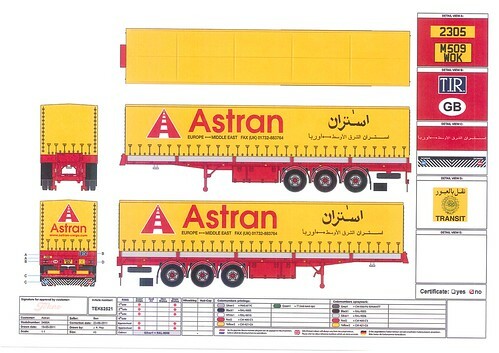 This entry was posted in Astran, International Mega Trucking, Models, Scania by truckbloguk. Bookmark the permalink.